Yep- Mom definitely has her hand in this project!. It's 10:16 p.m. and I realized I hadn't posted this week's progress. So.....it will be mostly pics, not so much chit-chat. 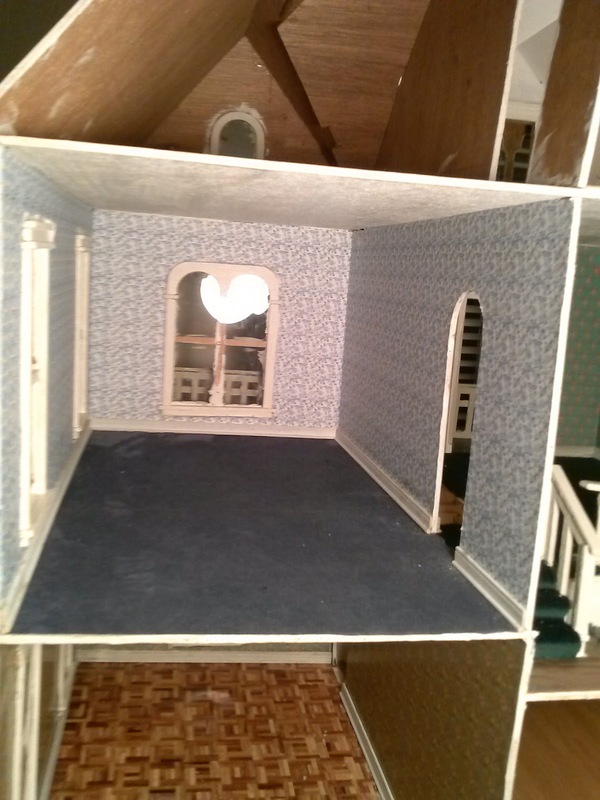 I needed to get some blue wallpaper for the second floor bedroom (along with the needed wallpaper mucilage mentioned last week) so I turned to www.miniatures.com for some cheap stuff. Their package of 12 assorted papers - 3 each of 4 designs - was cheaper than buying one specific design. I didn't really care what I got, just needed it blue. Mom apparently DID care. (For those who may not know, this project is in honor of my mom who passed away Dec. 2, 2011) What a shock when I opened the wallpaper package. BLUE ONION!!!! My mother had a "thing" for blue onion. She had at least 15 place settings of blue onion dinnerware. At one point in her life, all her kitchen accessories were Blue Onion. She even covered her cookbooks and recipe box in Blue Onion contact paper. 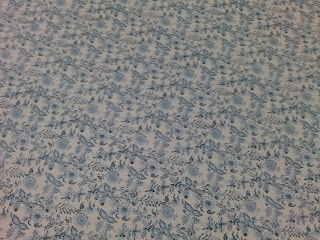 So - it seems fitting that the bedroom in the Hoarder House will be papered in Blue Onion. notice the unpainted trim under the plastic! Kitchen - with fabulous appliances by "Rita S."
Well, that's it for this week. Maybe I'll be able to sneak in a little work time during the week. Almost ready for the fun stuff - filling the house!!! In memory of the passing of miniature brick-and-mortar shops. What do you do when you run out of glue? Answer: Find another project! And mourn the passing of our brick and mortar shops. The inevitable happened this weekend. 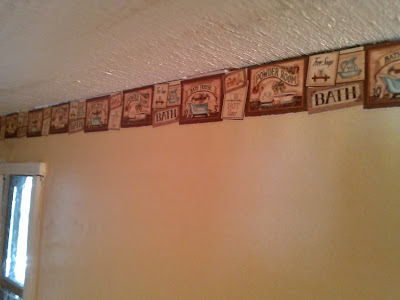 I ran out of the wallpaper mucilage I use. Yes, I suppose I could have tried a different product. But I didn't want to. I like what I was using: MiniGraphics Wallpaper Mucilage. I knew A.C. Moore had a small dollhouse section, so I headed out, hoping to purchase some there. No luck. They only carry a small selection of furniture, some Classics brand building components, some random carpets, along with a few accessory items. When Mom and I began actively pursuing our mini hobby, we had several choices of shops in the New Haven, CT area. I think it was maybe the late 1970's - early 1980's. Our favorite was "The Crafty Owl" in North Haven run by Hazel Smith. Hazel was a teacher who ran the shop outside of her work hours. 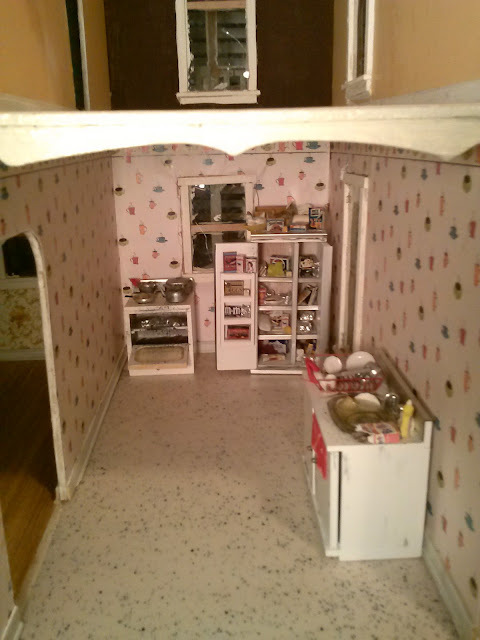 She also had a fun dollhouse "museum" in a separate room, that you could enter for the "huge" fee of 25 cents!! After a number of years running the store out of the first floor of an old home, Hazel moved her shop to a standalone shop on the main drag in North Haven. 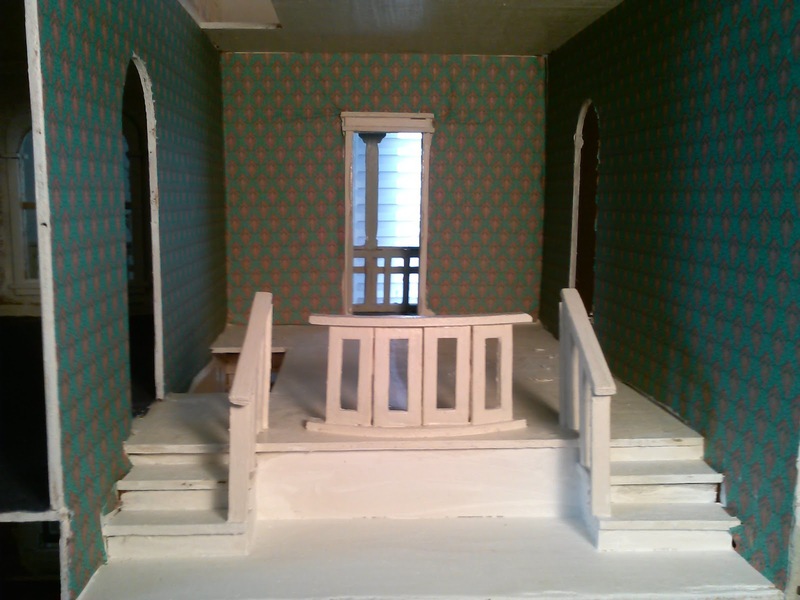 Hazel also ran the twice yearly doll shows at the New Haven Motor Inn. At some point, the date of which I can't remember, she retired, then, sadly passed away. I think her daughter, Florence had briefly considered carrying on her mother's work but she moved away (Pennsylvania?) and I lost touch. I often wonder what happened to Hazel's wonderful collection. 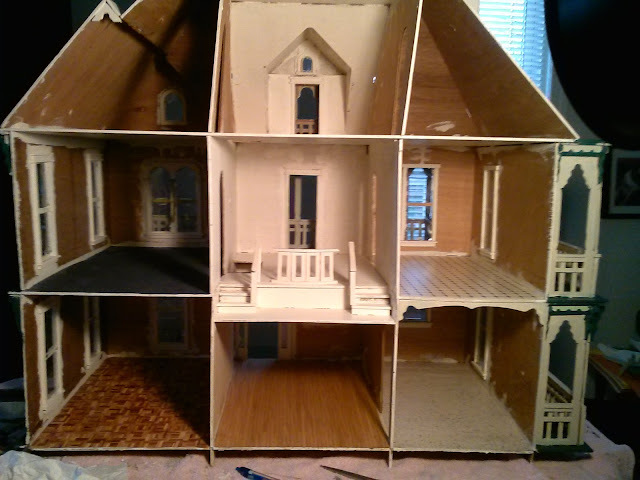 In those days, one had the choice of decorating in the Victorian style or the Colonial style. That was about it. Another local miniaturist Beverly Finley, owned Colonial Pine Miniatures. 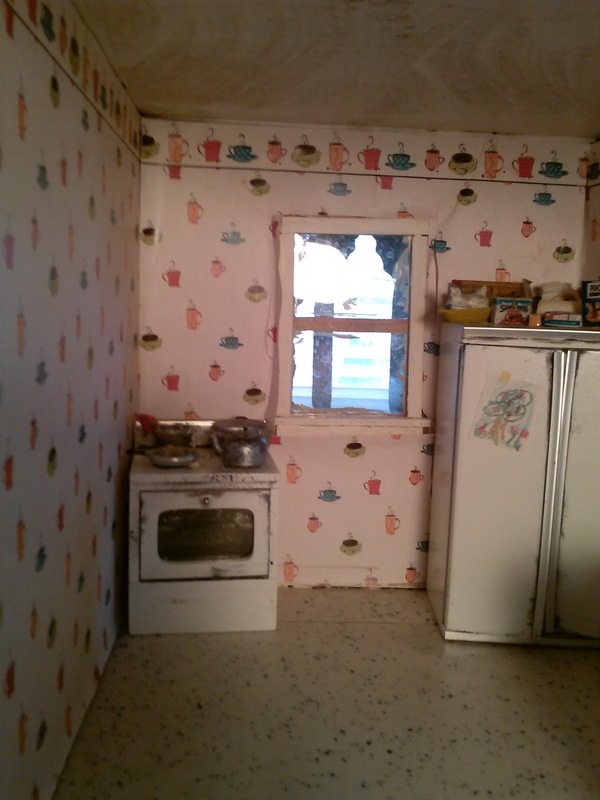 She had a little shop in her house, which was an original colonial salt-box home in Hamden. 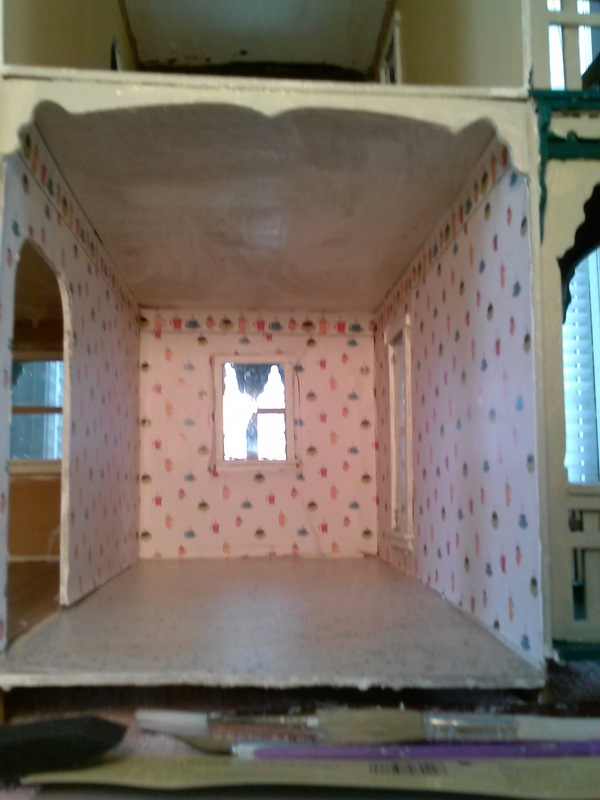 She also ran an annual dollhouse show. 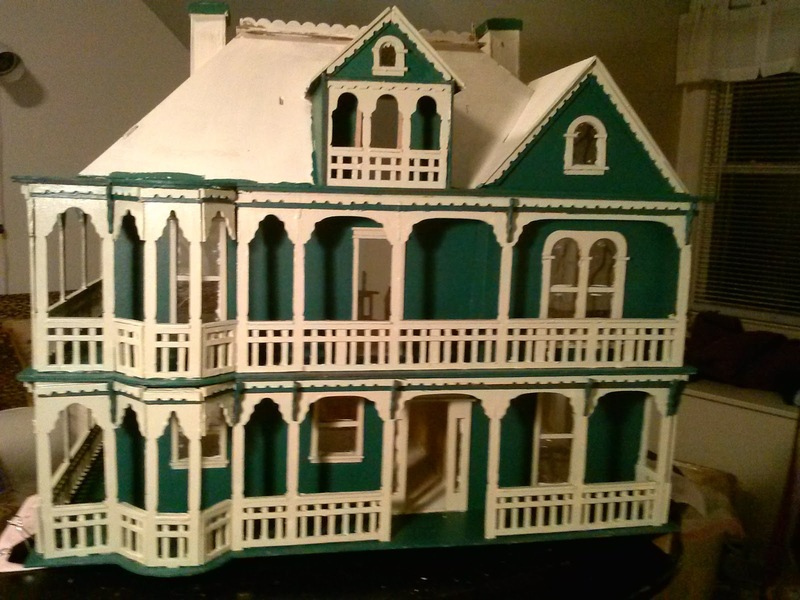 Mom bought me a present when I earned my Master;s degree: a 3 story townhouse, purchased from a small shop on Route 10 in Cheshire - can't remember the name. 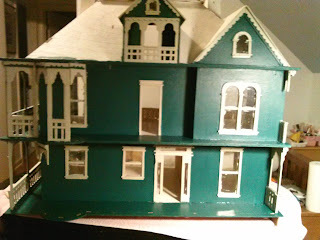 I spent tons of money purchasing beautiful resin windows and doors created by Derek Perkins for that house from Paul Lawson (hope I remembered the name correctly) who ran Miniature Mansions out of a small shop off Whalley Avenue in New Haven. That was 1985. Still haven't installed those windows! Then there was Roberta Glidden. Roberta ran local shows and opened shop in several locations: her home in Cheshire, a shop in the Watch Factory Mall in Cheshire and lastly a shop on Rt. 68 (I think!) in Cheshire, near Southington. Roberta usually held one of her shows the first week in March. As Mom's birthday was March 5th, we attended every year as part of her birthday celebration. One year, the show was on Mom's actual birthday! At that show she won one of her prized possessions: a British baby carriage. In Stratford, there was a shop owned by a funny woman who smoked a lot. It was later purchased by a man who wanted to keep the shop going - very commendable. Unfortunately, it didn't last long. In North Haven, we could also buy supplies at Hubie's Hobbies. The last shop I frequented was Mirabella Miniatures in Fairfield. The owner had to close her shop due to health concerns. There were other miniature shops in CT, of course, but these were the ones I frequented. I remember a shop in Seymour, one in Brookfield, and Molly Brody's in Stamford. Writing this, I am thinking someone should do a "History of Miniature Shopping in CT" Any volunteers? Oh, BTW - I ordered the wallpaper mucilage online. Should be here later this week. I've really stuck to my timeline....very impressed with myself. 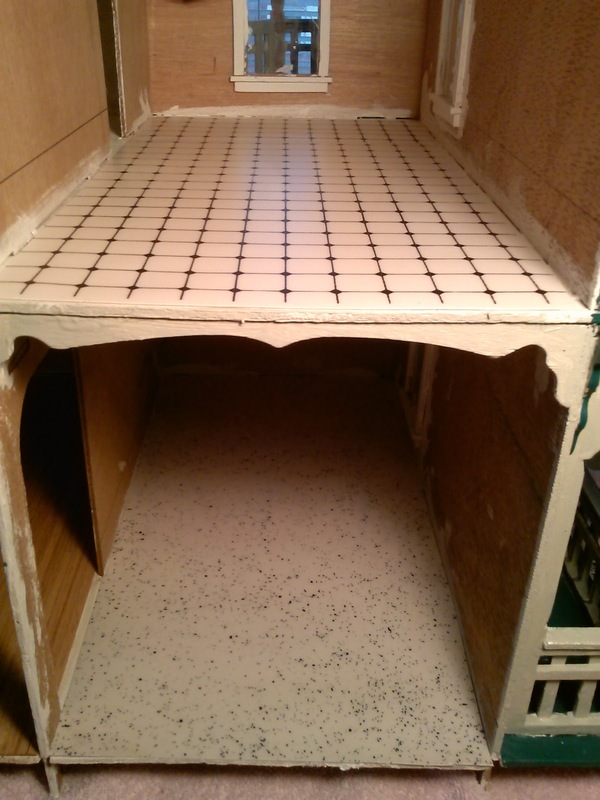 My plan was to do something on the Hoarder House EVERY week so that I could publish a new post each week. So far, so good! My fabulous daughter Caitlin, is home this weekend. She's off visiting friends, so I took the opportunity to wallpaper a few rooms. The picture below is the second floor hallway. Considering all the doorways and the trim, this was easier than I expected it to be. The room to the right is papered with a dollhouse-themed paper that Meghan picked out years ago. This will become the "CRAFT ROOM". The paper is really adorable - created by "Itsy Bitsy Mini", it has a cute bath signs border. Like Mom, I don't cope well with delays. I want it done NOW! Solution: Paint the back wall. New Problem: Don't have yellow paint. New Solution: Paint the wall an accent color! I chose brown......'cause that's what I had available!! Above is a closeup of the bathroom border. How cute is that? Actually, I think it turned out quite well. The bathroom was very difficult to paper. 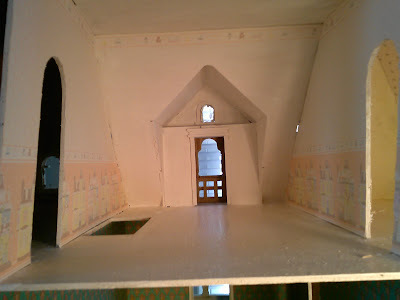 The room is quite narrow and it was tough to maneuver the craft knife around the window and door trims. I made a few boo-boos. Very thankful I don't have to be perfect in this house!! 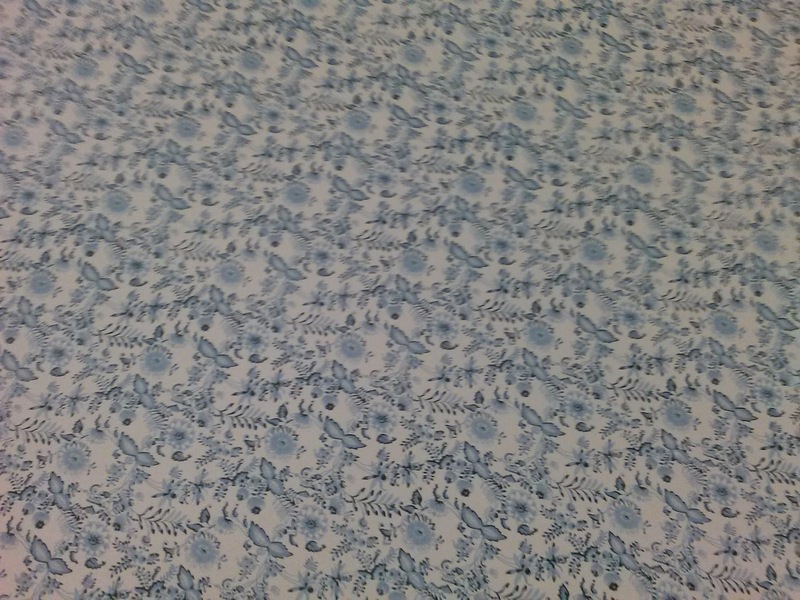 Also from "Itsy Bitsy Mini" is the kitchen paper. I am very impressed with the quality of their papers. Much heavier than typical dollhouse papers and fabulous designs! Below is a closeup of the border design. This room was also tough to paper. Seriously. 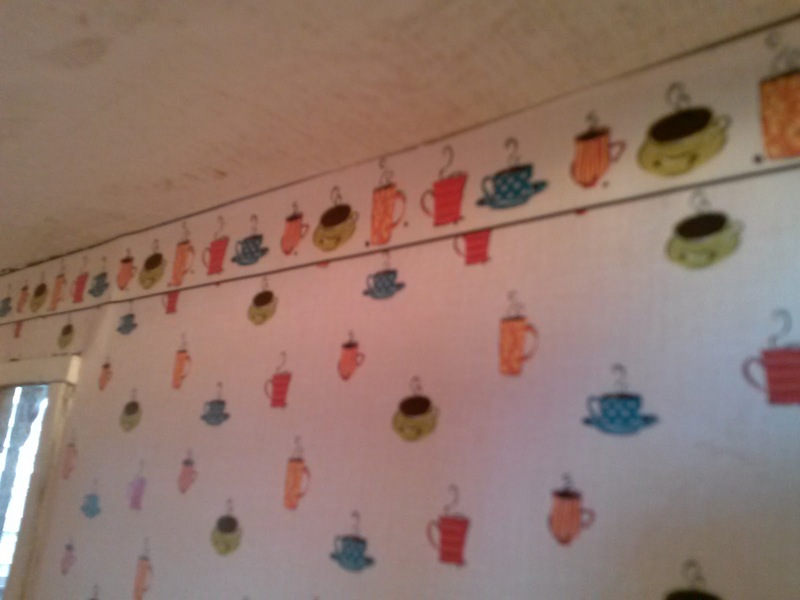 I'll create some cute curtains to hide some of the errors I made around the window trim. Anyway...I had no idea what I would do with the set at the time, but I just couldn't leave them there. So glad I didn't!!! Here is a sneak peek at the pieces. To the left are the stove and refrigerator. In a later post, you will be able to see the insides. A hoarder's dream!! Can't wait to find out who "Rita '92" is. She's obviously a very talented lady! To the right is the kitchen sink. You also can see the mess on top of the fridge pretty well in this shot. 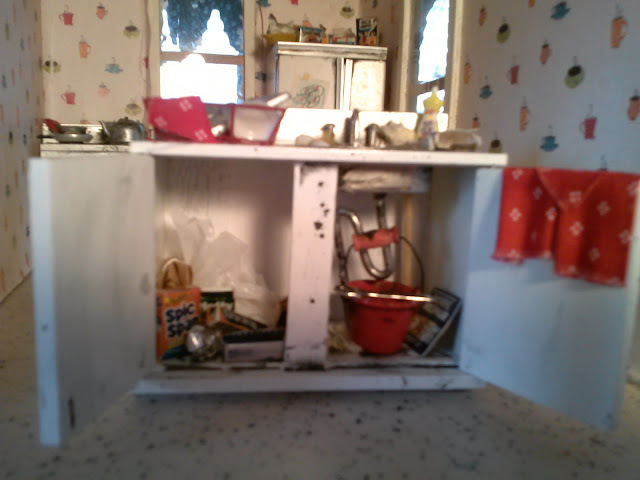 Below is a pic of the opened kitchen sink. Rita didn't forget a thing!! I love the messed up pipes and the red pail. That's it for this week. 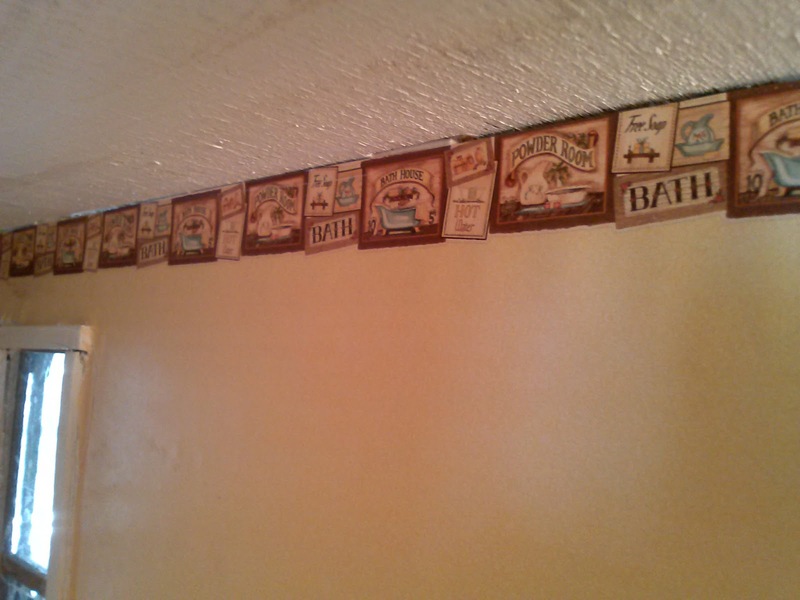 I ran out of wallpaper mucilage, so until I get a new jar, I'll be focusing on painting and installing trim. I had planned to spend the day in my raggedy sweats, doing laundry and wallpapering the Hoarder House. 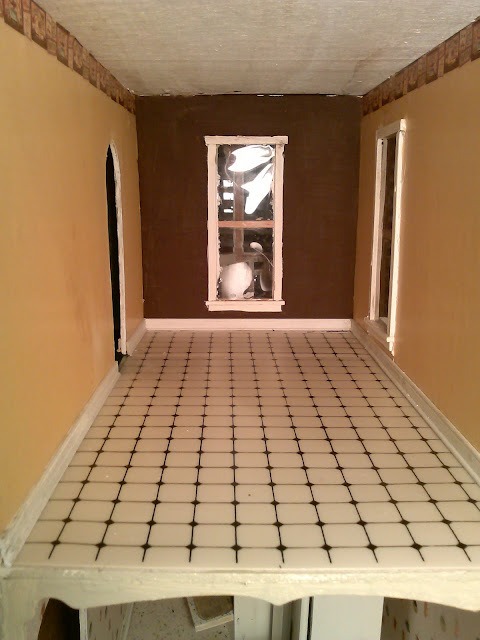 I did finish the laundry.....and I did paint the walls with a base coat. But...then....YAY! My friend, Doreen called and I decided to spend some time with her and went out to lunch. In my defense, I did accomplish most of what I set out to do. I wasn't going to paint, but I know the wood is extremely dry on the house and I thought it best to put a sloppy base coat on to prevent the wallpaper mucilage from simply seeping into the walls. I only painted the rooms where I'm going to use light-colored paper. Even though I probably should paint all the walls, I just don't feel like it! Let's pretend I'm testing the glue vs. dry wood theory. It's definitely going to be a challenge papering around the windows and doors. I've already decided to use drapery to cover up the few wood frames that were put in backwards, preventing me from painting them. 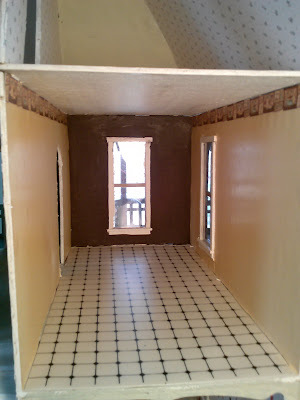 Since the plastic is over the window frames raw wood is showing towards the room. I could pull out the windows but I think I'd make a bigger mess trying to fix them. As my mom used to say, "That's what curtains are for." Since it's her "fault" the windows are in backwards it's only fitting to use her solution to a messy house. She would draw her drapes and keep the lights low so as not to see whatever needed cleaning. I found several good choices in my stash. Some, like the dollhouse paper above, were chosen by the girls many years ago. I decided to look in the Hobby Builders Supply catalog just for kicks (www.miniatures.com) and found some inspiration. I chose a few designs that Mom really would have liked in her own home. I should have those by next week. 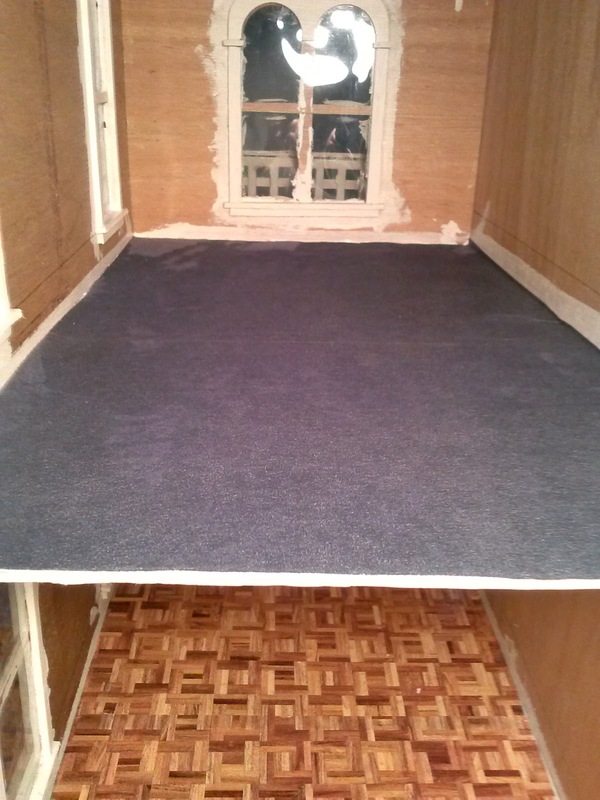 This week's task was to begin the process of laying flooring. I had a few things laying around in my stash that I used. These are linoleum - like tiles that are very flexible and easy to cut with a craft knife. I adhered them to the floor using spray adhesive.I thought the splattered design would be perfect for a kitchen floor. 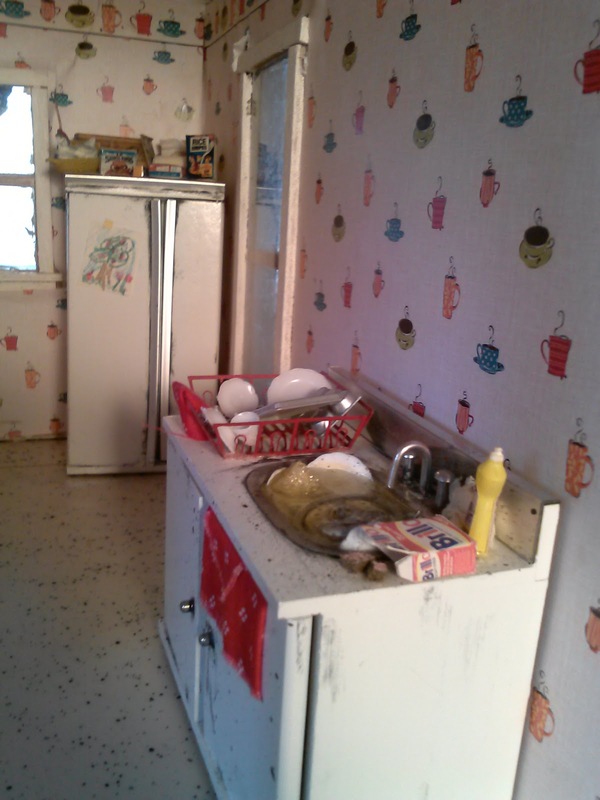 Could be 1950s or 1960s era so great for a house of no specific date. 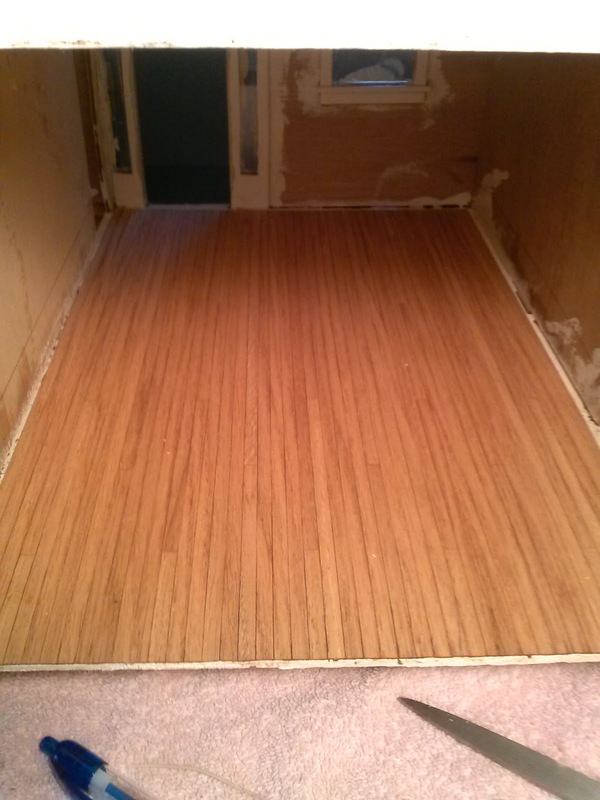 I'm really happy with the way the living room floor came out. The genuine red oak strips come backed on sheet of paper. 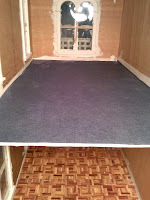 You simply use an adhesive (again I used spray adhesive) to adhere the flooring. I chose to darken the floor a bit by staining it with MinWax cherry stain/sealer. I am debating whether to use this room as a living room or dining room. Normally, one would enter the living room or parlor from the front door. But, then the room to the left would have to become the dining room. Food would have to be brought through the living room from the kitchen. I really love the product I used for this room. (dining room.....living room????) It's called COVERALLS and is made by Savvi Products, Inc. (www.savvistuff.com). They have a great catchphrase: "Clever products for clever people." Oh yeah.....that's me...clever. It's kind of like a cross between a decal and really delicate contact paper. I bought it years ago. The product is not created specifically for dollhouse, but when I saw this design, it yelled out to me, "Hello!!! 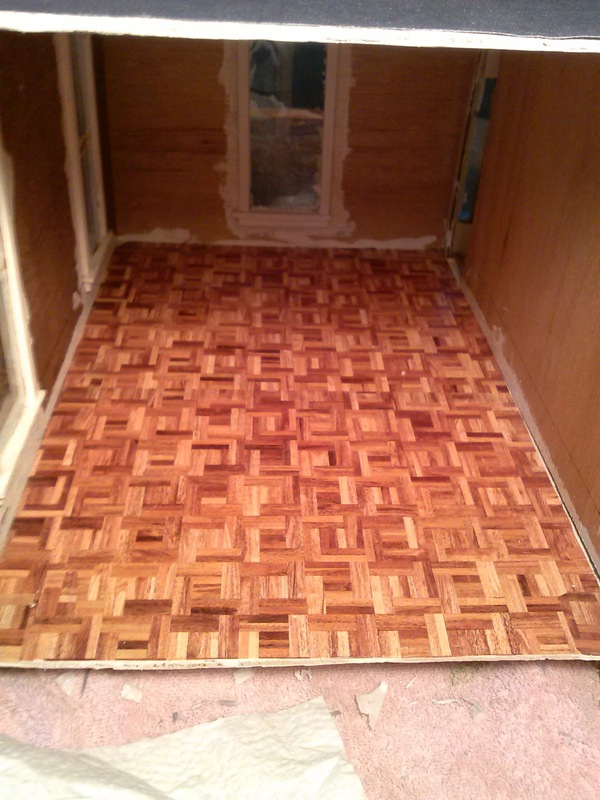 I am a parquet floor!!!" After cutting to size, you remove the protective backing which exposes the adhesive. Lay the sheet down then wet the entire surface with a sponge. Wait a respectable amount of time for the paper covering to dry a bit so you can separate the covering from the decal. Of course, not surprisingly, I didn't wait a "respectable" amount of time. So I accidentally scratched some of the decal while rubbing off the wet protective layer, leaving some white spots. I patched those spots. Good. Now it's a little messy looking....happy hoarder house. The bedroom was almost too easy. Leftover dollhouse carpeting. Cut to size. Spray adhesive. Done. So.....five floors done! 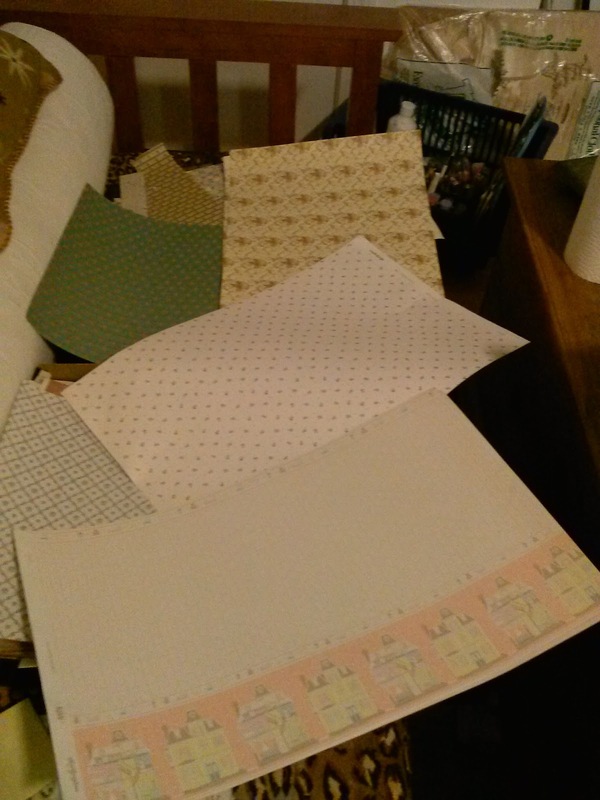 Next week I will begin working on the wallpaper. But......I do have something to decide. The third floor divider walls are obviously crooked and the rooms on the left and right are pretty small. 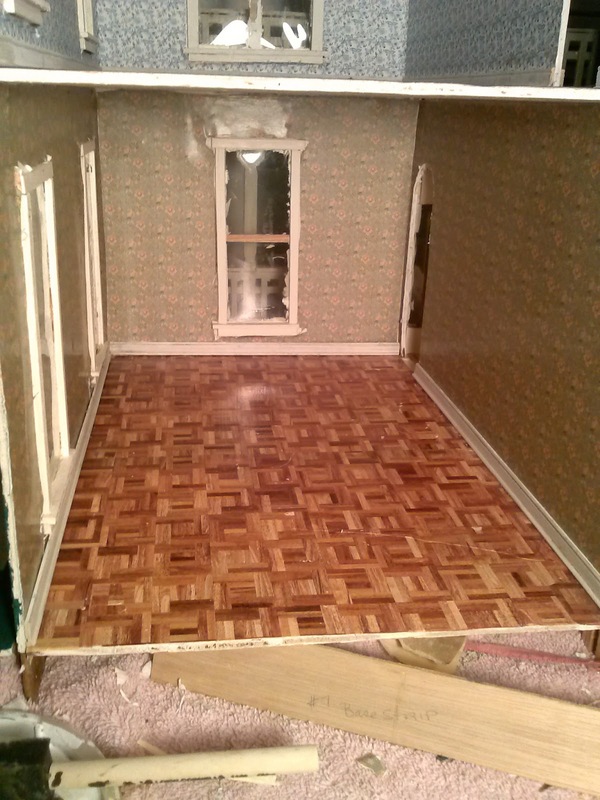 I am considering removing the walls to create one large attic space. 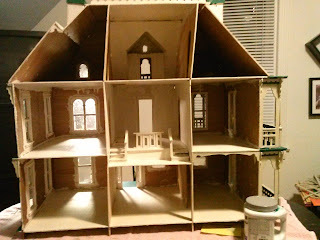 I also wanted to have a craft room in the house. Will have to give this some thought. I could not get that thing back into place. I figured the problem had to do with the tab-and-slot construction. Once the building was constructed, it was impossible to fit the tabs into the slots - there was no "give" to allow the needed movement into the slots. So.....I sliced off the tabs and used extra glue to secure the base of the balcony. I think it looks pretty good actually. Some of the arches don't quite fit and there are several missing gingerbread supports. Not sure how I'll deal with that. But...it's the Hoarder House - it's not supposed to be perfect! I located the box and examined the picture. What? There's supposed to be a cupola on top of the round porch area? Don't think I have any pieces for that. But it does explain why there are some slots up there! I'll work on that next weekend. Another issue...should I electrify the house? I originally started to - using a Cir-Kit kit. I vaguely remember struggling with those tiny brads and getting "slightly" miffed.....might need to reconsider that. I also purchased some goodies: some tiny scissors (for the scherenschnitte) and a ladder from Janice at Feather My Nest (on eBay she's candylamb) Mom and I used to buy from Janice all the time. She's from Brimfield, MA and is often at Molly Cromwell's Sturbridge shows. 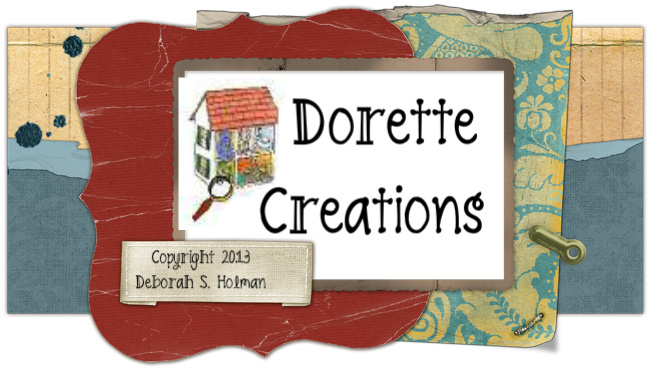 Since I decided to use the Hoarder House as a showcase for the hobbies that both Mom and I enjoyed, I purchased some stamp and coin kits from Ann Vanture at PaperMinis. 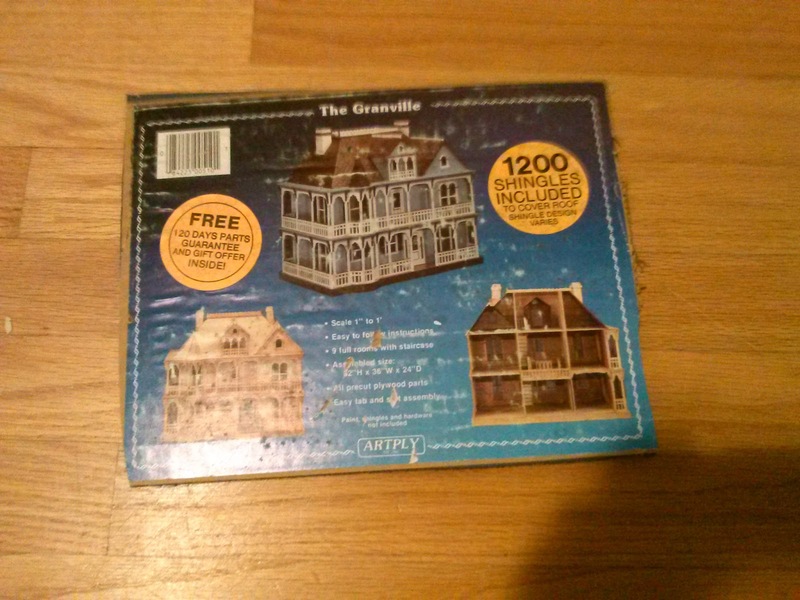 I also got kits to make a doll scrapbook and a set of house painting items. Looking forward to using this coming Good Friday to make those items. If I can make those tiny items look as good as they do on her website, it will be a Good Friday!! "Don't be a hoarder." These were some of my mother's last words. Surprisingly, the warning was not directed at me, but to my sister, Jeanne. (Ok....truth be told: I wasn't in the room at the time.) Mom wasn't a hoarder - not in the classic sense anyway - but she loved her "collections". Dolls, dollhouses, tiny tea sets, books. She was a crafter, always working on or planning a project. Mom built this house for my girls in 1997. Caitlin was 12 and Meghan, 8. 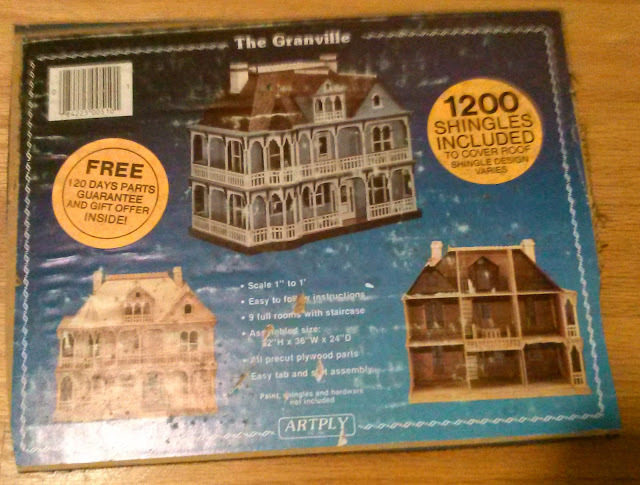 The house, the Granville by ArtPly, was built in my mother's typical manner - quickly. As a result it was a bit lopsided and not quite as sturdy as it could be. 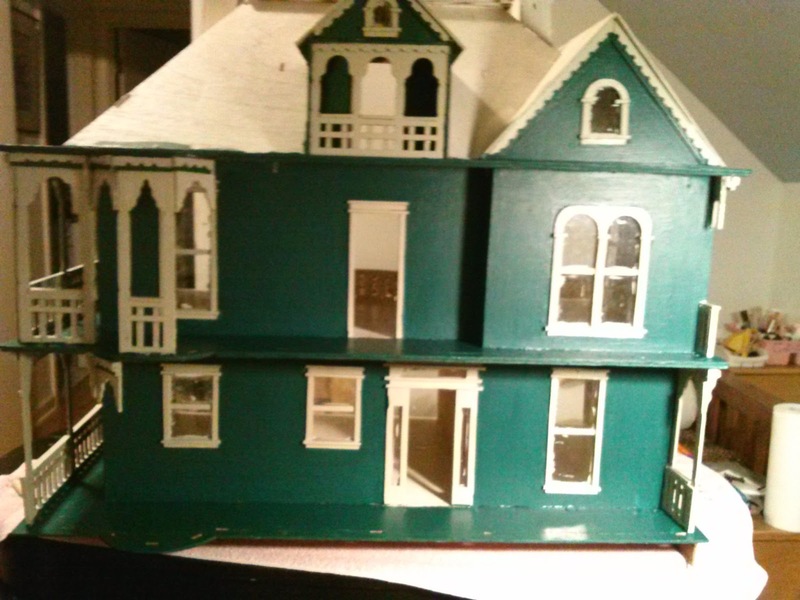 Mom also committed the "cardinal sin" of dollhouse building: DO NOT install windows or porches before painting the shell of the house. The girls and I moved the completely built structure to our home to paint it. What a pain! Trying to negotiate between porch railings and avoiding paint on the plastic windows was near impossibe. We left the house in the dining room and took a break.Then we had a house fire. 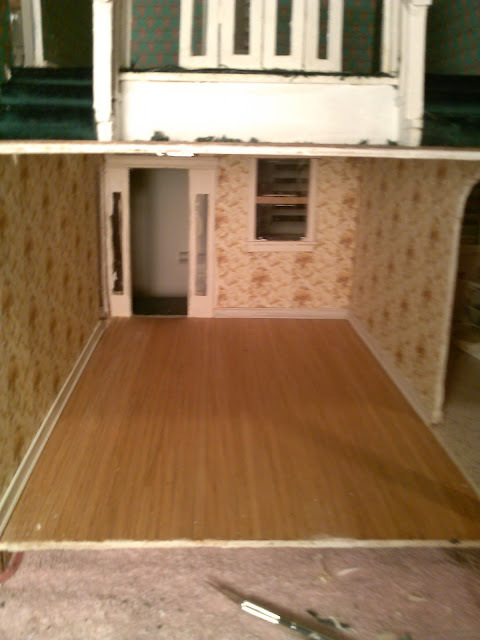 The dollhouse sustained some minor damage. Plaster from some holes punched in by firemen while putting out the fire in the wall littered the roof. Some larger pieces of plaster knocked off some of the porch railings. Just enough damage to put the project on hold - for 16 years. Mom passed away in December of 2011. I am the "keeper" of her collection. Slowly but surely I am finishing projects. 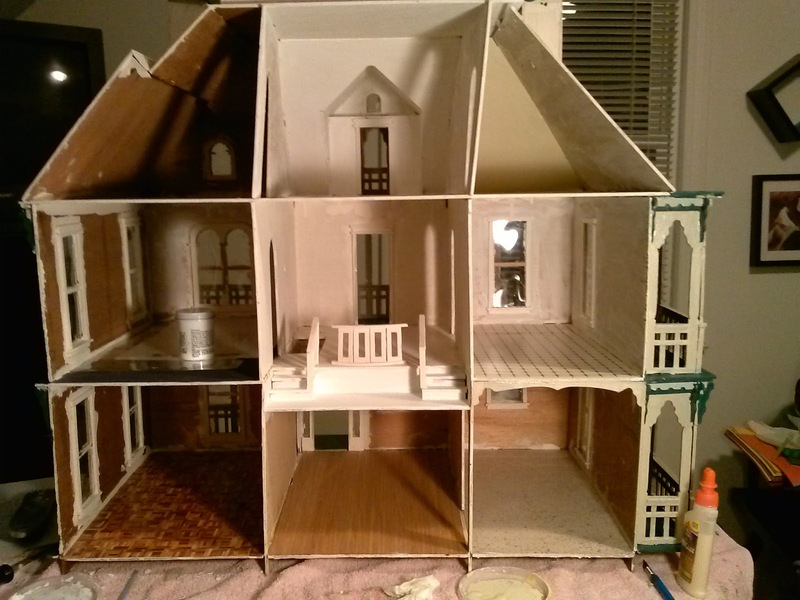 Last week I finished the 40s room box which features a dressed mannequin I won at one the last miniature shows Mom and I attended together. Now, I have hit on the PERFECT solution for this far-from-perfect building: The Hoarder House!! The Hoarder House will be chock-full of items that reflect Mom's hobbies as well as mine. I hope it will be a fitting tribute to the woman who built this house hoping to share her love of miniatures with her beloved grand-daughters. No worries, Mom. I won't be a hoarder.....but thank goodness I saved all your stuff! The 40s Roombox - pg. 2: Yes - I ripped the paper!